3888 Northside Drive | Macon, GA 31210 Call 478.477.4044 Today! One of the most important jobs you have as a parent is keeping your child safe when riding in a vehicle. Each year, thousands of young children are killed or injured in car crashes. Proper use of car safety seats helps keep children safe. But with so many different seats on the market, many parents find this overwhelming. If you are expectant parents, give yourselves enough time to learn how to properly install the car safety seat in your car before your baby is born to ensure a safe ride home from the hospital. The type of seat your child needs depends on several things, including your child’s age, size, and developmental needs. Read on for more information from the American Academy of Pediatrics (AAP) about choosing the most appropriate car seat for your child. This chart is a quick guide on where to start your search. It’s important to continue your research to learn about each seat you use. Car safety seats may be installed with either the vehicle’s seat belt or LATCH (lower anchors and tethers for children) system. LATCH is an attachment system for car safety seats. Lower anchors can be used instead of the seat belt to install the seat, and many parents find them easier to use in some cars. The top tether improves safety provided by the seat and is important to use for all forward-facing seats, even those installed using the vehicle seat belt. Although the seat belt and LATCH systems are equally safe, caregivers may prefer one system instead of the other. Keep in mind that only one system should be used unless the car safety seat and vehicle manufacturer say it is OK to use 2 systems at the same time. Tether anchors are located behind the seat, either on the panel behind the seat (in sedans) or back of the seat, ceiling, or floor (in most minivans, SUVs, hatchbacks, and pickup trucks). All forward-facing car safety seats have tether attachments that fasten to these anchors. Nearly all passenger vehicles and all car safety seats made on or after September 1, 2002, are equipped to use LATCH. Note: Seat belts—If you install a car safety seat using your vehicle’s seat belt, you must make sure the seat belt locks to help get a tight fit. In most newer cars, you can lock the seat belt by pulling it all the way out and then allowing it to retract to keep the seat belt tight around the car safety seat. Additionally, many car safety seats have built-in lock-offs to lock the belt without having to lock the seat belt separately as well. Refer to the vehicle owner’s manual for details about how your seat belt locks. Middle of the back seat—The safest place to ride for all children younger than 13 years is the back seat. If possible, it may be best to ride in the middle of the back seat. However, it is sometimes difficult to install a car safety seat tightly in the middle if the vehicle seat is narrow or uneven. Also, many vehicles do not have lower anchors for the middle seating position. It is safest to put the car safety seat in a position where you can install it tightly with either the lower anchor system or seat belt; in some cases, this may be on either side of the back seat rather than the middle. A child passenger safety technician (CPST) can help you decide which place is best to install your child’s car safety seat in your vehicle. The AAP recommends that all infants ride rear-facing starting with their first ride home from the hospital. 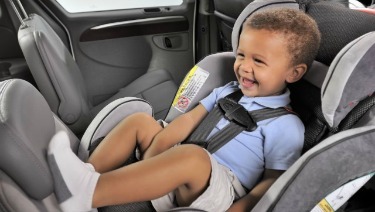 All infants and toddlers should ride in a rear-facing seats, as long as possible, until they reach the highest weight or height allowed by their car safety seat manufacturer. When infants outgrow their rear-facing–only seat, a convertible seat installed rear facing is needed. Most convertible seats have limits that will permit a child to ride rear-facing for 2 years or more. Usually, come with a base that can be left in the car.The seat clicks into and out of the base so you don’t have to install it each time you use it. Parents can buy more than one base for additional vehicles. Can be used rear facing and, later, “converted” to forward facing for older children when they outgrow either the weight limit or the length limit, for rear facing. This means the seat can be used longer by your child. Always read the vehicle owner’s manual and the car seat manual before installing the seat. 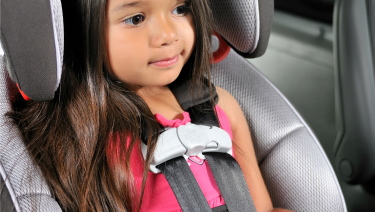 Place the harnesses in your rear-facing seat in slots that are at or below your child’s shoulders. Ensure that the harness is snug (you cannot pinch any slack between your fingers when testing the harness straps over the child’s shoulders) and that the harness chest clip is placed at the center of the chest, even with your child’s armpits. Make sure the car safety seat is installed tightly in the vehicle with either LATCH or a locked seat belt. If you can move the seat at the belt path more than an inch side to side or front to back, it’s not tight enough. Never place a rear-facing seat in the front seat of a vehicle that has an active front passenger airbag. If the airbag inflates, it will hit the back of the car safety seat, right where your child’s head is, and could cause serious injury or death. If you are using a convertible or 3-in-1 seat in the rear-facing position, make sure the seat belt or lower anchor webbing is routed through the correct belt path. Check the instructions that came with the car safety seat to be sure. Make sure the seat is at the correct angle so your child’s head does not flop forward. Check the instructions to find out the correct angle for your seat and how to adjust the angle if needed. All rear-facing seats have built-in angle indicators or adjusters. Check the car safety seat instructions and vehicle owner’s manual about whether the car safety seat may contact the back of the vehicle seat in front of it. What if my baby’s feet touch the back of the vehicle seat? A car seat should be approved for a baby’s weight. Very small babies who can sit safely in a semi-reclined position usually fit better in rear-facing–only seats. Preterm infants should be tested while still in the hospital to make sure they can sit safely in a semi-reclined position. Babies who need to lie flat during travel should ride in a car bed that meets Federal Motor Vehicle Safety Standard 213. They should be tested while in the hospital to make sure they can lie safely in the car bed. Always read the vehicle owner’s manual and the car seat manual before installing the seat. Any child who has outgrown the rear-facing weight or height limit for his convertible seat should use a forward-facing seat with a harness for as long as possible, up to the highest weight or height allowed by his car seat manufacturer. It is best for children to ride in a seat with a harness as long as possible, at least to 4 years of age. If your child outgrows a seat before reaching 4 years of age, consider using a seat with a harness approved for higher weights and heights. Built-in seats: Some vehicles come with built-in forward-facing seats. Weight and height limits vary. However, do not use built-in seats until your child is at least 2 years of age. Read your vehicle owner’s manual for details about how to use these seats. Travel vests: Vests can be worn by children between 20 and 168 pounds and can be an option to traditional forward-facing seats. They are useful for when a vehicle has lap-only seat belts in the rear, for children with certain special needs, or for children whose weight has exceeded that allowed by car seats. These vests may require use of a top tether. Always read the vehicle owner’s manual and the car seat manual before installing the seat. It is important that the car seat is installed tightly in the vehicle and that the harness fits your child snugly. Move the shoulder straps to the slots that are at or above your child’s shoulders, or position at or closest to (above or below, based on rear or forward facing) the child’s shoulders. Check the instructions that came with the seat to be sure you are positioning the shoulder straps correctly. Always use the top tether when you can. A tether is a strap that is attached to the top part of a car safety seat and holds the seat tightly by connecting to an anchor point in your vehicle (often on the seat back or rear shelf; see your vehicle owner’s manual to find where tether anchors are in your vehicle). Tethers give important extra protection by keeping the car safety seat and your child’s head from moving too far forward in a crash or sudden stop. All new cars, minivans, and light trucks are required to have tether anchors as of September 2000. Forward-facing seats come with tether straps. A tether should always be used as long as your child has not reached the top weight limit for the tether anchor. Check the car safety seat instructions and vehicle owner’s manual for information about the top weight limit and locations of tether anchors. It’s best to avoid this, especially if your vehicle has airbags in the front seat. All children younger than 13 years should ride in the back seat. If absolutely necessary, a child in a forward-facing seat with a harness may be the best choice to ride in front. Just be sure the vehicle seat is moved as far back away from the dashboard (and airbag) as possible. What do I need to know if my child will be driven by someone else, such as for child care or school? To move the shoulder straps to the slots that are at or above your child’s shoulders, or position at or closest to (above or below, based on rear or forward facing) the child’s shoulders. Check the instructions that came with the seat to be sure you are positioning the shoulder straps correctly. Child care programs and schools should have written guidelines for transporting children, including All drivers must have a valid driver’s license. In some states, school bus drivers need to have a special type of license. Should my child ride in a car seat on an airplane? Read your seat’s instruction manual and look for a label on the car safety seat that says, “This restraint is certified for use in motor vehicles and aircraft.” You can also consider using a restraint made only for use on airplanes and approved by the FAA. Larger children may use the airplane seat belt or continue to use their car safety seat on the airplane as long as it is labeled for use on aircraft and the child has not exceeded the seat’s weight or height limit. Remember that your child will need an appropriate car safety seat to use at your destination. For more information, visit the FAA Web site or the CARES Airplane Safety Harness for Children Web site. Booster seats are for older children who have outgrown their forward-facing seats. All children whose weight or height exceeds the forward-facing limit for their car seat should use a belt-positioning booster seat until the vehicle seat belt fits properly, typically when they have reached 4 feet 9 inches in height and are 8 through 12 years of age. Most children will not fit in most vehicle seatbelts without a booster until 10 to 11 years of age. All children younger than 13 should ride in the back seat. He reaches the top weight or height allowed for his seat with a harness. (These limits are listed on the seat and also included in the instruction booklet). High-back and backless are 2 standard types of booster seats. They do not come with harness straps but are used with lap and shoulder seat belts in your vehicle, the same way an adult rides. They are designed to raise a child up so that lap and shoulder seat belts fit properly over the strongest parts of the child’s body. When using a booster seat, always read the vehicle owner’s manual and the car seat manual before installing the seat. Booster seats often have a plastic clip or guide to correctly position vehicle lap and shoulder belts. 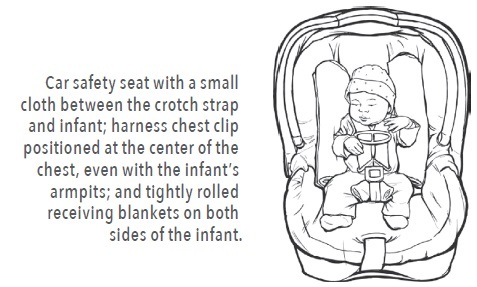 See the booster seat instruction booklet for directions on how to use the clip or guide. The lap belt lies low and snug across your child’s upper thighs. The shoulder belt crosses the middle of your child’s chest and shoulder and is off the neck. 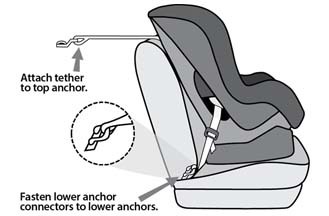 If your booster seat has lower anchors or top-tether attachments, check its booklet for installation instructions. Use a travel vest (check the manufacturer’s instructions about the use of lap belts only and about the use of lap and shoulder belts). What is the difference between high-back and backless boosters? Both types of boosters are designed to raise your child so seat belts fit properly, and both will reduce your child’s risk of injury in a crash. High-back boosters should be used in vehicles without headrests or with low seat backs. Many seats that look like high-back boosters are actually combination seats. They come with harnesses that can be used for smaller children and, later, removed for older children. Backless boosters are usually less expensive and are easier to move from one vehicle to another. Backless boosters can be used safely in vehicles with headrests and high seat backs. I’ve seen products that say they can help make the seat belt fit better. Should we get one of these? 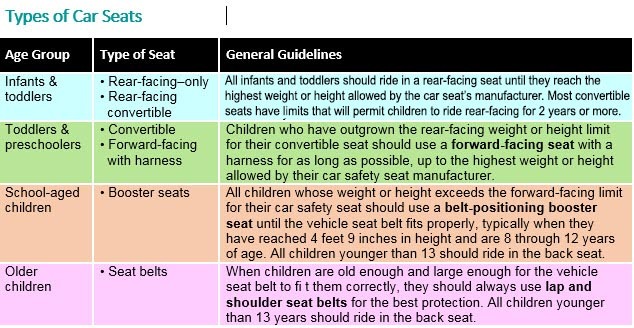 No one seat is the “best” or “safest.” The best seat is the one that fits your child’s size, is correctly installed, fits well in your vehicle, and is used properly every time you drive. Don’t decide by price alone. A higher price does not mean the seat is safer or easier to use. Avoid used seats if you don’t know the seat’s history. Does not come with instructions. You need them to know how to use the seat. You can’t see any damage to the car seat. If you are unsure, call the manufacturer of the seat. Vehicles with no back seat or a back seat that is not made for passengers are not the best choice for traveling with small children; however, the airbag can be turned off in some of these vehicles if the front seat is needed for a child passenger. See your vehicle owner’s manual for more information. Side airbags are available in most new cars. Side airbags improve safety for adults in side-impact crashes. Read your vehicle owner’s manual for more information about the airbags in your vehicle. Read your car seat instructions and the vehicle owner’s manual for guidance on placing the seat next to a side airbag. National Child Passenger Safety Certification (Click on “Find a Tech” or call 877/366-8154.) – Includes a list of CPSTs fluent in Spanish and other languages or with extra training in the transportation of children with special needs. Always read and follow the manufacturer’s instructions for your car seat. If you do not have those, write or call the company’s customer service department. They will ask you for the model number, the name of the seat, and date of manufacture. The manufacturer’s address and phone number are on a label on the seat. Also, be sure to follow the instructions in your vehicle owner’s manual about using car seats. Some manufacturers’ instructions may be available on their Web sites. Remember to fill out and mail in the registration card that comes with the car safety seat. You can also register your seat on the manufacturer’s Web site. It will be important in case the seat is recalled. Latch image adapted from National Highway Traffic Safety Administration. LATCH Makes Child Safety Seat Installation as Easy as 1-2-3. DOT HS publication 809 489. Published March 2011.https://www.safercar.gov/parents/CarSeats/pdf-carseat/English/LATCH_Installation.pdf. Accessed January 13, 2017.